Fisher is on pace for his most offensive season despite missing 21 games. It’s very rare in this day and age to have a player have their most productive season at the age of 34, but for Mike Fisher that’s exactly what is happening. The Nashville Predators currently sit atop the NHL standings and though he has been injured for a good portion of the season, Fisher has been a large factor in the team’s recent success. The Preds centre has played just 29 games this season, but has still managed 13 goals and 25 points. The Peterborough, ON native is currently riding the highest points per game total of his career at 0.86. He has continued to be a versatile forward playing in all situations adding six power play goals and one shorthanded goal. His markers with the extra man lead the team this season, two more than Craig Smith who is second on the team with four. The husband of country music icon, Carrie Underwood, missed the beginning of the season after he sustained an Achilles injury during the off-season. And though he went pointless in his first three games to start the year, he has been on fire ever-since. So with that considered, Fisher actually has 25 points in his last 26 games. Tuesday night against the Maple Leafs, the 6-foot-1 215 pounder, had a goal and two assists which was his second three-point performance in his last four games. He has 14 points over his last 12 games and though he has played just 241 games with the Predators he is already 18th on the team’s all-time scoring list. This year fisher is on pace for 27 goals and 52 points. It would be his highest single-season goal total of his career and one point off of his career-high set back in 2010 when he had 53 with the Ottawa Senators. If he is able to tally 27 more points the rest of the way and hit 52 points, he will hop up to 14th place on the all-time Preds scoring list, passing former Predator and current New Jersey Devil, Marek Zidlicky. Though he has been fairly productive for the Preds, he has missed 48 games with the team since joining them during the 2010-11 season. In fact Fisher during his 16 seasons in the NHL, he has never played a full 82-game season. But despite missing 21 games this year, Fisher has continued to play with a physical edge, sitting sixth amongst all Nashville forwards with 61 hits. He is second on the Preds with a 5-on-5 shooting percentage, with only Mike Ribeiro’s total of 20.83% better than his 14.63%. 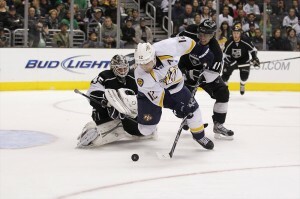 Fisher is also second amongst Nashville forwards with 24 blocked shots. 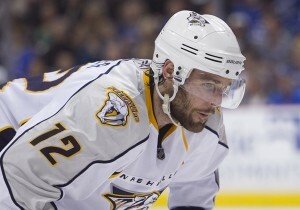 Fisher will become a free agent this summer, but he and Carrie Underwood call Nashville home. What will make these stats all the more interesting is that Fisher will become an unrestricted free agent on July 1st. At his age one wouldn’t expect him to garner a raise, but proving that he still has the ability to put up impressive numbers at into his mid-30s he just might. Fisher is currently making $4.2 million this season. He is an asset physically, offensively, and his speed, as it has been throughout his career, continues to be arguably his strongest attribute. He can be a great pickup for any team, but there is just one problem with that. Fisher and wife Carrie Underwood call Nashville home. He originally wanted to go Nashville because it is where his wife is from and it seems nearly guaranteed he will do anything to stay even if it means a pay decrease. Fisher is coming towards the end of his career, but if this season has proven anything it is that he is still a very valuable part of his team. He is having a career year and like a good bottle of wine, seems to be getting even better with age as he hits the ice in his 16th year in the NHL.